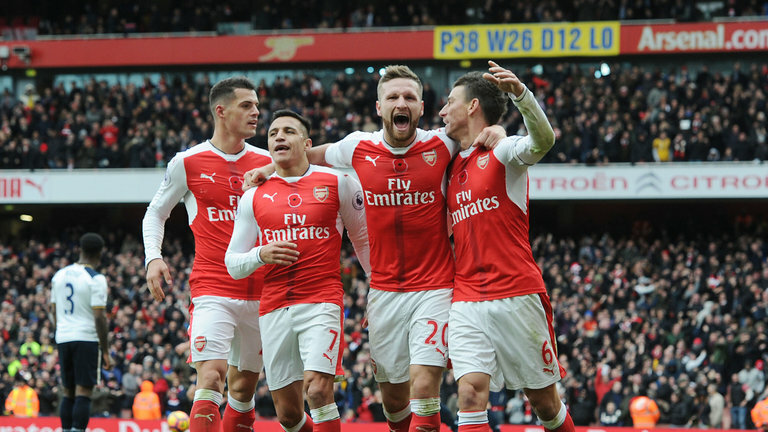 Another chance to climb to the top of the table went begging, as Arsenal and their neighbours shared the spoils in a vibrant derby. The Gunners could have been home and dry by the half time whistle, but a mixture of profligate finishing, the woodwork and some cynical fouling from spurs meant that the home side went into the half time break with a one goal lead, thanks to a Kevin Wimmer own goal. 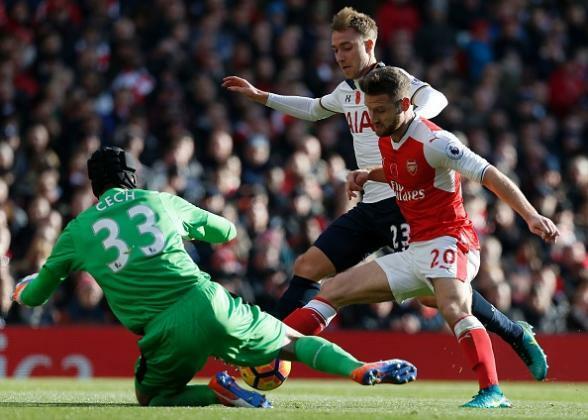 The second half was a vastly different affair, and the pace and pressing from Arsenal virtually disappeared, with tottenham allowed to make all the running. This conspired to give them an equaliser, in the form of a penalty thanks to Laurent Koscielny’s depserate challenge on the onrushing Dembele. Harry Kane, in his first game back from his layoff, put the spot kick away, and the rest of the half could have made the Gunners pay, although a spurs win would’ve been harsh. Football isn’t exactly the scales of justice however. Before kickoff, both sides went into the game with contrasting recent fortunes. The home side hadn’t lost a fixture since the opening day of the season, and spurs had not won in their last five. Form in derby games rarely comes to the fore though, so the hope of a wounded animal turning up to The Emirates was never a reality. There was plenty to glean from the 90 minutes, but here are 5 keypoints from the match that may pique your interest, or you may disagree with! This was more than a disappointing result. Our opponents had a striker who hadn’t played in over two months. They were also playing in an experimental formation, which means the men attempting to implement such a style would be unfamiliar with team orders and movement. They were there for the taking. Yet, for large periods of play, we invited them onto us. 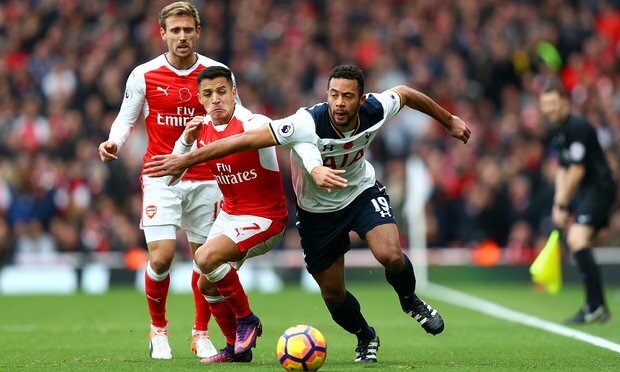 What was more frustrating, was that when we did play as we have at times this season – pressing quickly and attacking with pace and accurate passing – then spurs had no answer. We just didn’t do it enough. This was a huge missed opportunity. The last few games has seen our youngster wilt a little. Setting the bar so high means that there will always be a dip, and he is in the middle of his, but it isn’t all bad. He never hid and always wanted the ball. His final product is the part of his game that has most suffered, and again it was missing in this game. What has been highlighted as a deficiency in his game is his reluctancy to track back, and yet during his stint on the pitch for yesterday’s derby, he was a permanent ally for Nacho Monreal. He harried and was always switched on in a defensive sense. If he can ally both attacking and defence in his game simultaneously then he will have cracked it. For Alan Shearer to decree that the Premier League only has one world class player in Sergio Aguero is laughable. Kevin Debruyne, Mesut Ozil and Eden Hazard may have something to say about that, but Alexis Sanchez is another who deserves that accolade. Even in his darkest days, he still affects proceedings, and during the North London Derby, he was the one player who was at the forefront of everything we did that hurt spurs. The Chilean is unpredictable and gives us a fluency. If he is fit, he plays, no matter if he played three days ago. Keep that man fit! On occasion, Mustafi was caught out and the gap that he left could’ve hurt his team’s efforts. For the majority though, the German defender showed huge tenacity and great positioning to combat the opposition who were allowed to impose themselves. This at times was down to a midfield presence more inclined to start attacks than quell them, but it matters little. Mustafi still has a little polishing to do, but he will only improve with experience and his bond with Koscielny grows. The international break is welcome for once. I’m not overtly superstitious, but our record over November over the years is well documented, and scares me greatly. 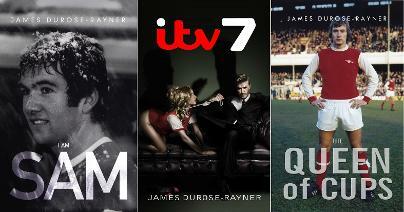 So for international football to take a sizeable chunk out of this infernal month is not a bad thing. Normally, the break from domestic football is nothing but misery, but any chance to avoid more dropped points is fine by me. We are still within striking distance at the top, and more importantly, Mesut Ozil will be granted a rest by Joachim Low and Germany. Nothing but positives. Aside from the boredom. So, a missed opportunity, not only to break the spirit of our neighbours but to exert our influence at the top of the table. We have played better, and we will do in the future. We will need to as well, if we are to put this team where it belongs. We have the squad, so let’s prove we have the mettle.